I’ve been an on-and-off-again homebrewer for about four years, and there’s a reason I go off again. I’m not very good at following directions, and I’m easily frazzled when something goes wrong, especially when dealing with things that are boiling. So I’ve made a few stove-top creations with mixed results, including a nut brown ale that yielded bottles that exploded upon opening. When I get a chance, I jump on-board and assist a real homebrewer, and this recently happened when I worked with Tom. Tom and I are in the same homebrew club, but that’s like saying the batboy is a member of an MLB team. 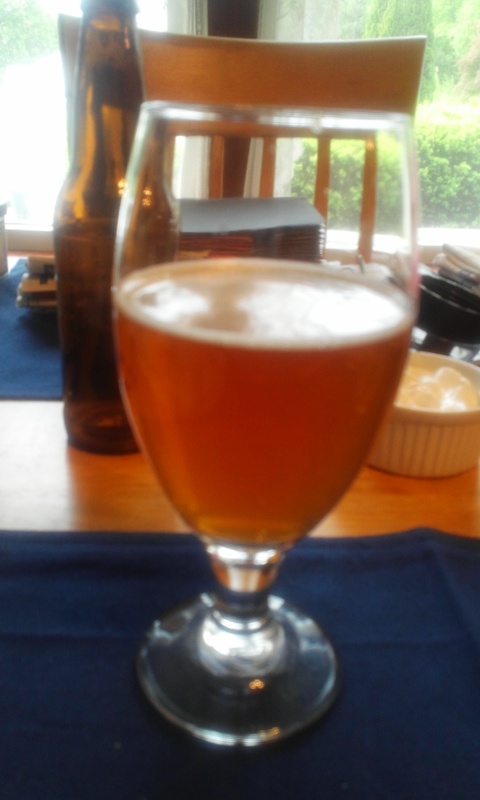 Tom’s the real brewer, and it was with his equipment and recipe that we made a Belgian pale ale (pictured). I bottled my share of the brew day, and now, nearly two months later, it’s ready to drink. I’m really happy with it. It starts out very sparkling, but smooths out quickly. It’s got a solid malt backbone and enough hops to give it a summer bite. We over-hopped it late, which gives it a slight citrus tang. The saison yeast comes through by giving it a freshly-baked bread quality. It’s a pleasure and a privilege to pour my own beer. I might just be on again.